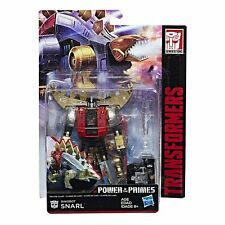 Transformers Power of the primes SNARL & SLUDGE, Deluxe, MISB. Character : Snarl. Product status. Character Family. LEGO、Building Blocks. Year : 2018. Country/Region of Manufacture : China. Office Supplies. Country/Region of Manufacture. It is real plastic colored prototype, no painted, not fake! not Knock-off! important to us, and we will be appricate of every bit of helping you made. I promise we can find a way to fix it. The Feed back. | 2 foreign language of note seal, there is that the product identification seals are stuck. [ Country of Manufacture ]. [ Li-ion Battery ]. [ Note : Pre-Order (P/O) ]. [ Condition ] New. Japan Usage Item. Transformers Generations Power of the Primes Deluxe Class Dinobot Snarl NEW USA! 4.5 out of 5 stars - Transformers Generations Power of the Primes Deluxe Class Dinobot Snarl NEW USA! 8 product ratings8 product ratings - Transformers Generations Power of the Primes Deluxe Class Dinobot Snarl NEW USA! I will answer to the best of my ability! - What you see is what you get! This is in very nice condition and would make any collector happy! We have anywhere from sealed,loose,parts,and even afa graded! Trending at C $25.83eBay determines this price through a machine-learned model of the product's sale prices within the last 90 days. Made by Hasbro in 1989. Sold as-is. They are factory sealed to the card. The card shows light shelf wear. Selling a collection? message me. Condition: Mint on Sealed Card. Light wear only. Comes as shown. Trending at C $46.77eBay determines this price through a machine-learned model of the product's sale prices within the last 90 days. Listing is for a Transformers Animated Snarl Dinobot Deluxe Class figure. I combine shipping and ship international so please view my other listings for more great items! Trending at C $21.31eBay determines this price through a machine-learned model of the product's sale prices within the last 90 days. Hi and thanks for watching , here we have a new sealed on card - power of the primes dinobot Snarl . please have a look at the pictures and feel free to ask anything you like to know . Let's just be real and call him what he is, ok?. He includes his club weapon. Paint / Decals / Scuffs / Rust / Dust etc. : SEE PHOTOS . SNARL Transformers 4 Age of Extinction Generations Deluxe 5" inch Figure 2014. Condition is New. Shipped with USPS First Class Package. Snarl With DVD + Brimstone Transformers Cybertron Jungle Planet BOTH MISP! View Pictures and UtilizeZoom Function. United States. 5 out of 5 stars - Snarl With DVD + Brimstone Transformers Cybertron Jungle Planet BOTH MISP! 3 product ratings3 product ratings - Snarl With DVD + Brimstone Transformers Cybertron Jungle Planet BOTH MISP! Hasbro "Age of Extinction" 2014 series. Complete in great shape as shown. What you see is exactly what you will get. Here we have a Transformers Universe Snarl figure. Figure is still attached to the insert as seen in photos. Figure will be removed from insert for shipping. Insert not included. Figure is unused as it was new in package, but the package got beat up over the years so it was tossed. Item has light wear. PayPal is the only payment option. Payment due immediately after auctions closing. International sales are only through the E-bay Global Program. All items are sold as-is and we do not accept returns, so please ask any questions you may have before bidding. 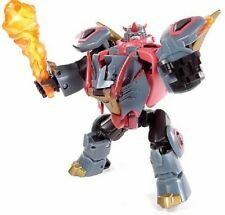 TRANSFORMERS UNIVERSE RID ROBOTS IN DISGUISE SNARL LION BEAST NEW SEALED!